I have been contacted by some of my valued customers regarding whether I will be running a paper share this year. And, I am happy to say that YES, I am running one! You are going to love all of these gorgeous designs. They are perfect for doing #loveitchop it cards. You can make 18 card fronts out of every pack you get in this share. That means that this share can make 126 cards and it's only $35. you need more, you can buy them from my online store. How Do I Reserve a Paper Share? Click here to register. I will add you to a paper share list and send a PayPal invoice to you. One payment has been made, we will send through your share. The cut-off date for paper shares is January 15, 2018. I will tabulate all of the information and place the order that night based on how many groups of 4 I have. As soon as the paper is received, we will cut the paper, add labels and send it out to you. 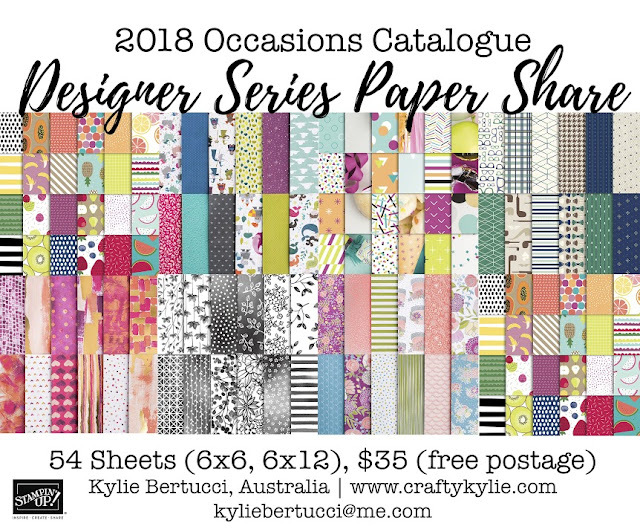 The cost for this is paper share is $35 (including postage) - Australian Residents Only.